On a day of bracing winds and frequent showers, Galway offered a foretaste of what may be in store when the weather improves. Starting just six of the team that began last year's All-Ireland final and despite losing Padraic Mannion to injury after 22 minutes, they ended Wexford's interest in the National League on Saturday with a powerful surge immediately after half-time. Wexford, who had defeated Galway in the League quarter-finals last year and also in Salthill the season before, led 3-5 to 0-13 at the interval after facing the strong wind. But Galway re-emerged a changed team and outscored the visitors 2-5 to 0-1 in the opening 15 minutes. There was no way back. The winners face Waterford in next weekend's semi finals, who they lost to in Walsh Park after conceding a late goal just over a week ago. 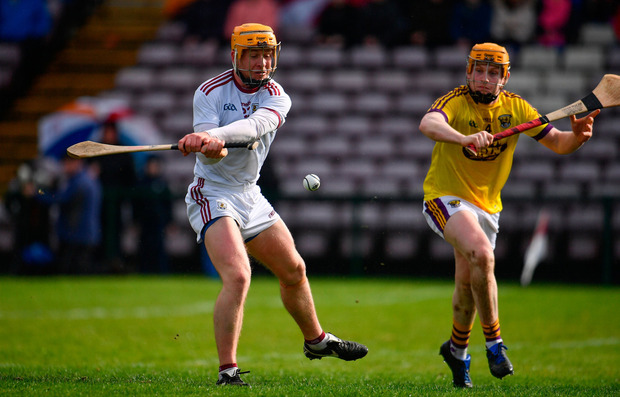 Joe Canning gave an exhibition of smooth striking in a 0-15 scoring return, made up of 13 frees, a '65' and an inspirational point from play, while Cathal Mannion hit 1-2 and enchanted the home supporters with his mesmeric wrists. 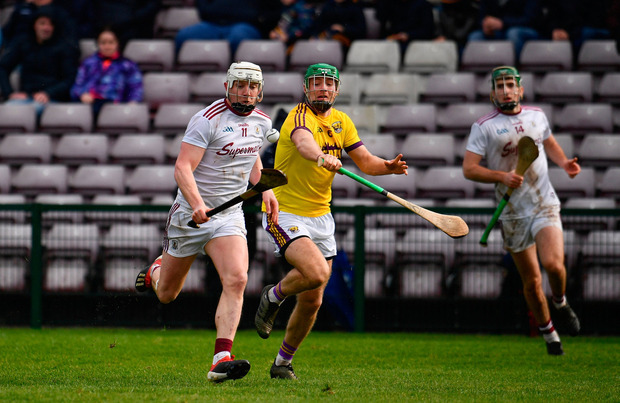 Canning scored all but one of Galway's first-half total, but after the interval the Tribesmen's attack caught fire, starting with Mannion's goal two minutes in, the midfielder going for the jugular when running at the Wexford defence and finishing off the hurl. Six minutes later Wexford were exposed again when the impressive Brian Concannon played a clever ball to the unmarked Davy Glennon, whose effort was stopped by Mark Fanning, before Niall Burke finished the rebound. Galway's third goal didn't come until three minutes before the end when Canning's shot was saved by Fanning and sub Tadhg Haran scrambled home. But Wexford had a beaten look long before then. "I'd love to be able to tell you what went wrong, I don't know," said Wexford manager Davy Fitzgerald. "I thought we were well in control and we should have been up a lot more in the first half, probably four or five points, but there is no excuse, it has nothing to do with anyone only ourselves. Galway benefited from poor Wexford tackling and a high concession of frees that read 14-3 in the home team's favour in the first half. Some of the awards were generous but Fitzgerald did not seek comfort in excuses. Their second half was their worst in any of the competitive games they've played this year, he admitted, and lacked the fight that put Kilkenny to the sword a week before. "The boys are in bits in there over it, they're not happy," said Fitzgerald, who brings Wexford back to Salthill in the Leinster Championship on May 26. "But it just shows you, that if you stand off a team like Galway you're dead." 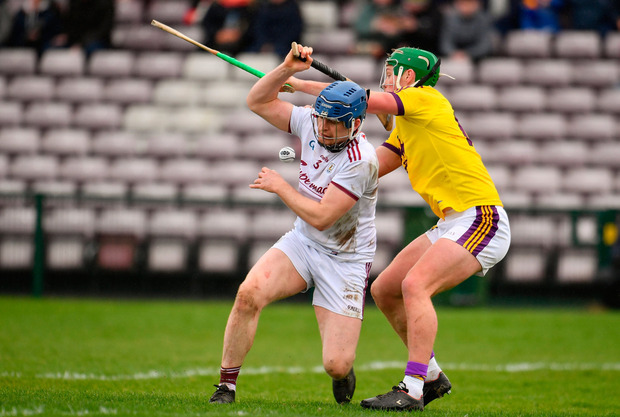 Wexford put three goals past Galway in the opening half, with Conor McDonald scoring twice, although the first had some luck, his weak ground shot poorly dealt with by Fergal Flannery in the ninth minute. Matthew O'Hanlon, who enjoyed a huge battle with Canning, helped set up the first goal after an excellent move out of defence. O'Hanlon also had a say in the second, when his high ball was fielded by McDonald over Paul Killeen before the full-forward placed a powerful shot past Flannery in the 24th minute. Lee Chin scored a third on the half-hour after Flannery denied the first attempt by Cathal Dunbar but lost possession when trying to take the ball away. "In the first half there was the concession of two goals we probably wouldn't have been happy with, and could have defended a little bit better, but that happens," admitted Galway manager Micheal Donoghue. "We addressed it at half-time, we had to work harder and get a better attitude in the second half and take care of the ball and use it, and I thought we did that really well in the second half." Scorers - Galway: J Canning 0-15 (13fs, 1 '65'), C Mannion 1-2, N Burke 1-1, T Haran 1-0, B Concannon 0-2, C Whelan 0-1. Wexford: C McDonald 2-2 (0-1f), L Chin 1-2, P Morris 0-4 (3fs, 1 '65'), D O'Keeffe, M O'Hanlon, A Nolan 0-1. Galway - F Flannery 6; J Grealish 7, P Killeen 6, D Morrissey 6; A Harte 7, P Mannion 6, G McInerney 8; C Mannion 9, S Loftus 7; N Burke 7, J Canning 9, C Whelan 7; S Bleahene 7, B Concannon 8, T Monaghan 7. Subs: K Hussey 7 for Mannion (22); D Glennon 7 for Monaghan (34); J Coen 7 for Morrissey (h-t); S Kilduff 7 for Harte (63); T Haran 7 for Bleahene (68). Wexford - M Fanning 8; D Reck 7, L Ryan 7, S Donohoe 7; P Foley 6, M O'Hanlon 8, S Murphy 7; J O'Connor 6, K Foley 7; A Nolan 7, L Chin 8, D O'Keeffe 7; C Dunbar 7, C McDonald 8, P Morris 6. Subs: D Byrne 6 for Ryan (inj 39); L Og McGovern 6 for J O'Connor (46); S Reck 6 for Byrne (inj 52); I Byrne 6 for Chin (inj 58); H Kehoe 6 for Morris (69). Ref - C McAllister (Cork).